Kyuukyoku Harikiri Stadium '88 Senshuu Shin Data (究極ハリキリスタジアム'88選手 新データバージョン, Kyuukyoku Harikiri Stadium '88 Senshuu Shin Data? lit. 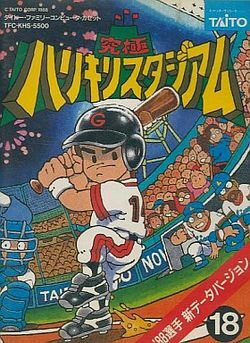 Ultimate Harikiri Stadium '88 Players Updated Data Version) is a baseball game developed by Taito Corporation for the Famicom. It is an updated version of Taito's original Kyuukyoku Harikiri Stadium. Like its predecessor, it is a straightforward baseball simulation game for the Famicom which was never released outside of Japan. Besides a roster update and a few graphical improvements there is little difference between this and the previous game in the series. This process of having minor incremental improvements between annual releases would eventually become common practice in console sports games. This page was last edited on 6 October 2015, at 02:39.